Summer is the season for fresh berries and nothing is better than a sweet strawberry, a juicy blackberry or a plump blueberry bursting with flavor picked fresh. Sometimes it is hard not to eat what you pick before you even make it back to the kitchen with the harvest. For those who might enjoy a tender flaky, slightly sweetened biscuit and a bit of whipped cream to go with those berries, you might want to try this. If you want the perfect way to enjoy fresh berries, besides just eating them out-of-hand, then whip up a batch of these tasty and tender gluten free biscuits for a very merry berry experience! If you can’t get fresh berries, frozen and thawed berries will work just fine. Add a few sprinkles of sugar to them if they aren’t sweet enough when they thaw and a touch of salt is a good idea, too. 1. Preheat Oven: Preheat oven to 400 degrees. Line baking sheet with parchment paper or spray with cooking spray. 2. Combine Dry Ingredients: Combine flours, starches, cream of tartar, xanthan gum, soda, salt and 3 Tablespoons sugar in a medium bowl. 3. Mix Wet Ingredients: In the bowl of an electric mixer, combine butter, egg and milk until combined. Beat on high 30 seconds, scrape down sides and mix 15 more seconds. 4. Add Dry Ingredients: Add dry ingredients to mixing bowl and beat on high 30 seconds. Scrape down sides of bowl and continue to mix on high until combined, about 15 more seconds. Scrape sides of bowl to make a mound in the center of the bowl and let batter rest for about 1 minute or so. Batter will seem soupy but will thicken slightly as it rests. 5. 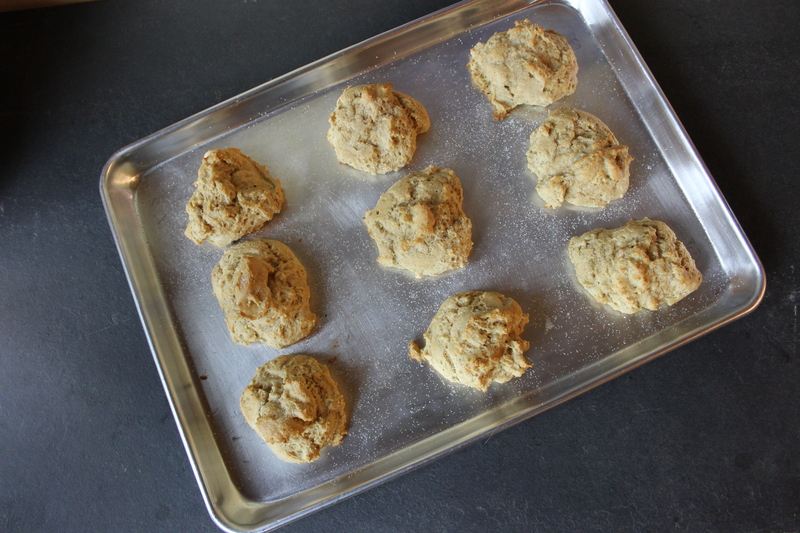 Bake Biscuits: Using a large cookie scoop or spoon, place large scoops (about 1/3 cup) of batter onto prepared baking sheet. Bake at for about 16 minutes, until golden brown. 6. Butter Biscuits: Remove biscuits from oven. Immediately brush each with melted butter and sprinkle with remaining sugar. Let cool. 7. Finish and Serve: Slice each biscuit in half horizontally, and serve with a 1/3 cup fresh sliced strawberries or other fresh berries and fresh whipped cream in the middle, if desired. Enjoy!